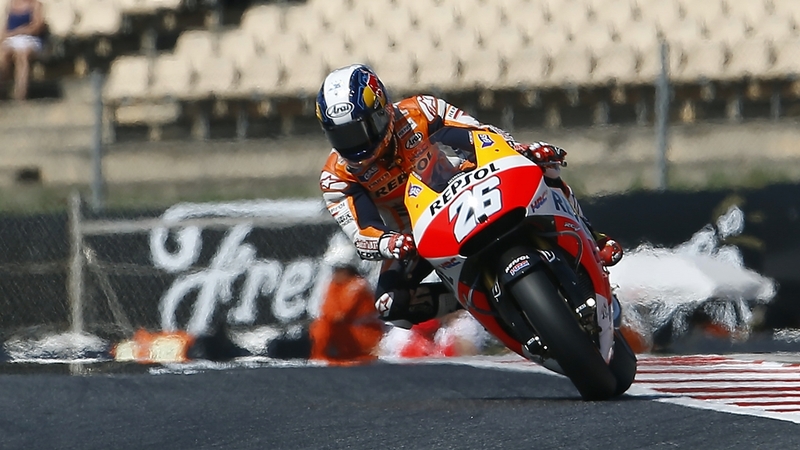 Dani Pedrosa claimed pole position at the Circuit de Barcelona-Catalunya for the second year running, after the Repsol Honda rider set a time of 1’40.985 to lead an all-Spanish front row at the Catalan Grand Prix. On another hot day where track temperatures reached over 50°C, Pedrosa kept his cool to claim the front slot on the grid from Yamaha Movistar MotoGP’s Jorge Lorenzo by just 0.115 seconds. Completing the front row was Repsol Honda’s Marc Marquez, who crashed while chasing his seventh-straight pole position but still managed to clock the third quickest time of 1’41.135. All riders on the front row used the medium compound slicks front and rear during their time attack in Qualifying Practice 2. The peak track temperature today of 54°C was recorded during Free Practice 4, with today’s objective for the teams being to find a tyre combination that could tame the greasy track conditions brought on by the scorching temperatures. With grip hard to come by from the track surface, the riders looked for maximum grip and stability from their tyres, and as a result, the medium compound front slick was preferred by almost every rider. Rear tyre choice for the race also became clearer after today’s practice sessions, with the Factory Honda and Yamaha riders, and the majority of the Ducati riders almost certain to race the medium compound rear slick. Most of the Open-class riders look set to choose the soft compound rear slick for the twenty-five lap Catalan Grand Prix. Weather forecasts indicate a high probability of rain tomorrow, and tomorrow’s Warm Up session at 0940 local time (GMT+1) may be the only opportunity for the riders to assess the circuit in wet conditions before the race commences tomorrow afternoon at 1400. “It’s been a big crash and now I’m sore, especially in the chest and right ankle, but fortunately nothing is broken. Today the feeling with the bike was better than yesterday, although everything is not yet in place as we would like: during the third free practice session we were not far from the fastest riders, and it was a shame not to be entered directly into Q2. In any case, we faced the Q1 calmly, then in Q2 I fell while I was on my first attempt, with the tyres already used in Q1. At least I had time to get back on track with the other bike in the end, in order to forget soon what happened. As I said we are not one hundred percent but I am confident for the race, because our pace is not very far from that of the other riders. We’ll have to keep an eye on the weather, and in any case we will give our best, as always”. “I’m really happy with my qualifying time; it’s only a shame we couldn’t get into Qualifying 2, but we knew we have a big disadvantage here with two long straights. Anyway, now we need to work for the race: we want to try and collect a few more points for the championship. Today we have been the fastest ‘Production Racer’ Honda, which is still our target, and now we want to make the same thing tomorrow in the race. Unfortunately we don’t know yet if we can use the softer tyre: it could be difficult, so maybe we have to use the hard tyre for the race distance. Hovewer, we will give everything and we will se how it goes”.